President Trump is done watching the GOP surrender. He is the one who forced the GOP to start fighting for border security and wall funding, even if it meant shutting down the government. But now, we are seeing the GOP's resolve starting to buckle. 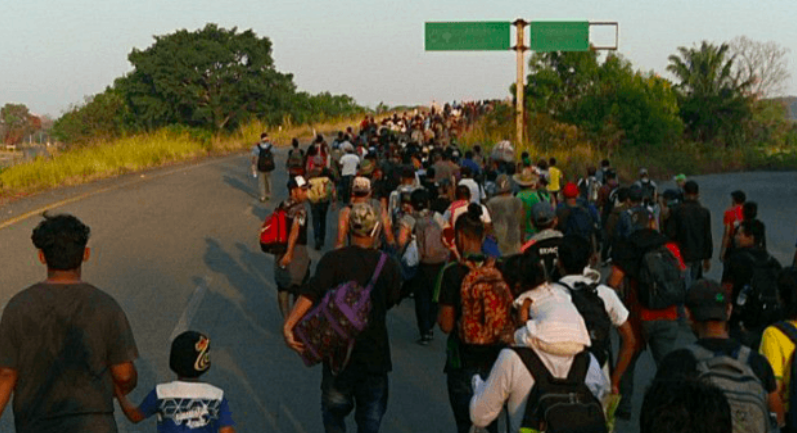 A new caravan has now left Honduras and is marching for the US-Mexico border. Democrats are deliberately blocking any border security funding from passing. No border wall funding... no new border security measures... They want to just let them all in. The President is fighting back, but he needs your help before it's too late! Please, send your instantly delivered hard-copy letter to Congress (below) and FORCE them to fund the wall and fully secure the southern border! You should be absolutely ashamed of yourself. You swore an oath to protect this country. That includes securing the southern border. Thousands of illegal caravan migrants are still camped out in Mexico. Every day, more and more try to invade the United States. This morning, a new caravan departed Honduras and started the trek to the United States. It will grow into the thousands by the time it gets here. We are already seeing illegal aliens scaling the border fence and trying to break into the country. Border Patrol reported a 300% increase in assaults on agents after the last caravan arrived. The CDC is at the border trying to treat illegal aliens who are entering the country carrying deadly diseases. And now, with another caravan bearing down on us, the Department of Homeland Security still has not been funded. This isn't an accident. You caused this. Over the past two years, you voted for spending packages that deliberately tied President Trump's hands. You refused to authorize funding to hire border patrol agents, build detention centers, upgrade existing fencing, or construct new border wall segments. And now, you and your colleagues want to do it again. Even in the midst of this immigration emergency, many of your colleagues want to pass a "clean" spending bill to re-open the government without appropriating any additional funds to border security. Democrat leaders promise that if Republicans just end the shutdown, they will consider funding border security. Pelosi and Schumer have already promised to block border wall funding from ever passing. They will never authorize border wall funding, just like Pelosi defunded the Secure Fence Act back in 2006. This shutdown fight could be Congress' last chance to secure the border. Years from now, future generations will learn about this fight to secure the border. What do you want the history books to say? Do you want to be remembered as the one who kept the border wide open? Or will you rise to the occasion and restore America's sovereignty? You know what you have to do. Fully fund the border wall and give Border Patrol and ICE all of the tools they need to keep your constituents safe.